In the last post, Nardvark was considering various writing purposes. Now, he needs to learn the specific techniques to use for each purpose. Nerdvark is always happy to help, if it means he gets to make fun of Nardvark in a constructive way. Remember, these are your purposes for fiction writing, or creative writing, as teachers like to call it. You are IMAGINING a world, characters, situations; you are EXPLORING an idea, theme, or feeling; you are ENTERTAINING your readers or audience. For an example of an exciting adventure story written by Nardvark that exemplifies all of the above, click here. Whether you are writing a story or exploring an idea, theme, or feeling through a poem or song, you need to make it deep by using lots of imagery, metaphor, symbolism, hyperbole, etc, and make it sound cool by using lots of alliteration, onomatopoeia, perhaps rhythm, rhyme, assonance, and so on. These are all literary techniques. For an example of a very literary poem written by Nerdvark to explore his pal Nardvark's various character traits, click here. 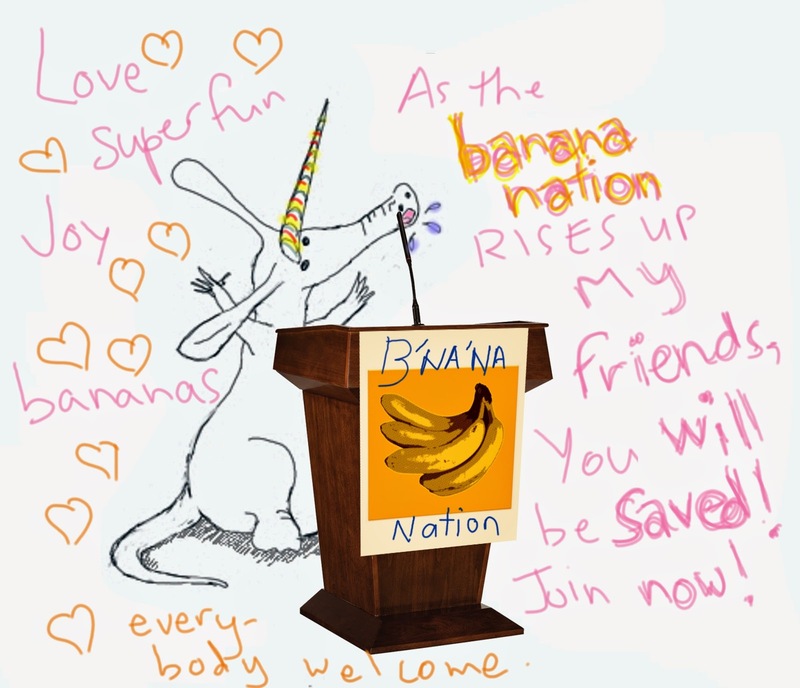 The Nardvark uses persuasive techniques to promote his new country, Banana Nation. Come one, come all! When you write to ARGUE a point, you are trying to make your audience agree with you. When you write to PERSUADE, you are trying to make your audience do something. When you write to ADVISE, you are telling your audience how to do something. There is only one Nardvark in the world; if it dies, its species will be extinct. What do you need to do to save him? Nardvark is not a good hunter or scavenger, so he needs your donations. Nardvark will eat anything, so whatever you donate will go on his pizza. Donate tinned food, condiments, expired dairy products, old shoes and boots -- he appreciates and eats it all. Can you find all the persuasive techniques used above? Check back next time for techniques for the other six writing purposes. For now, Nardvark wants to ride a porpoise (ooh, wordplay!) and play his favourite online video game, Spot the Kitty! Thanks for reading. If you find my posts helpful, please help out by donating to our kickstarter campaign, buying Nardvark's products, or simply visiting my writer website.